How does Venquis build client relationships? We take them on a bootcamp! Venquis consultants are quite literally prepared to go the extra mile for our clients. 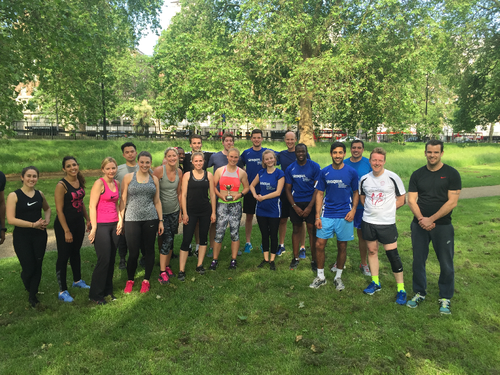 Dave Russell, now a senior consultant in Venquis’ retail team is an ex Royal Marine who used to run the UK’s largest outdoor fitness park, so he was the ideal person to put members of the HR and IT teams at Arcadia through their paces on a sunny afternoon in the park in the first Venquis Bootcamp. The afternoon’s challenge was to find out which team was the fittest and through the blood, sweat and tears, there was still time for lots of inter-team banter and friendly rivalry. At the end of a great session the IT team were crowned the fittest! The bootcamp was organised as an opportunity for two teams that our consultants worked closely with to get to know each other better and for Arcadia to promote the wellbeing of its employees. Thanks to all those that came along and for making the afternoon a huge success. We’re looking forward to making it a regular event!